Organic Nation Trailer from OrganicNation on Vimeo. 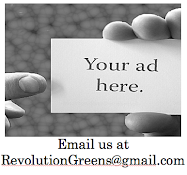 The questions asked in this trailer are some of the reasons Revolution Greens was founded. We have lost our connection with where our food comes from. Next time you have a chance take a peak in your fridge and check out where all your food is from. There is a good chance your eating oranges from California, bananas from Ecuador and perhaps a cantaloupe from Mexico. Very little of our food is locally grown and if it is it might not be organic. This movie could be very interesting.